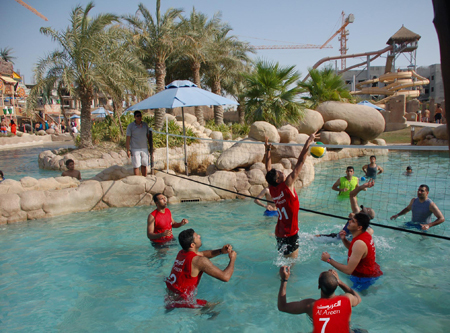 Al Areen won the first outdoor Water Volleyball Championship that was held at the Lost Paradise of Dilmun Water Park in an impressive final between the Central Bank of Bahrain and Al Areen. The four teams reached the semi-final went head to head in a knockout where Menatelecom took the bronze medal and the Central Bank of Bahrain took the silver medal. Al Areen walked away with the gold medal, the championship trophy and ten Splashdown passes (one for each team member) that allows them access to the Water Park for the rest of the 2009 season. “We are very happy with the results of the first Water Volleyball Championship in terms of organization and more so the demand that we have received from teams who wanted to sign up. I would like to congratulate Al Areen on their victory and all the other teams that have participated and helped in making this championship a success. When we initially thought of organizing this championship we approached our corporate list of companies because we only had four weeks before Ramadan and so we sent out invites to twelve companies. The response was overwhelming and now with results of the first championship, we will be looking at expanding it next year to incorporate more teams and to run it throughout the summer,” commented Paul Blunt, General Manager of the Lost Paradise of Dilmun. With their well deserved victory, Al Areen will be returning newt year as the defending champions for what promises to be the biggest outdoor Water Volleyball Champion Bahrain has never seen.